Spirited. Courageous. Resourceful. Innovative. See the history of our city. See the story of our city from before written history to the present, set in an engaging, fun, and interactive atmosphere. 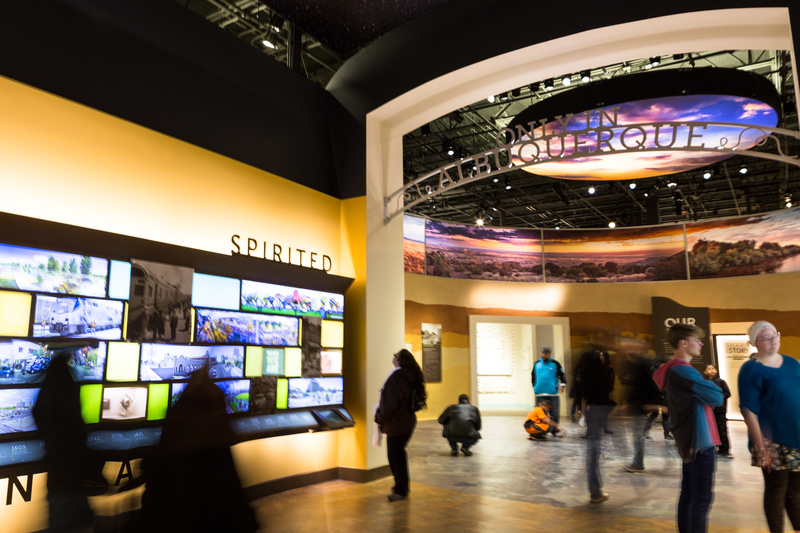 Our story is told through four galleries: Spirited, Courageous, Resourceful and Innovative, all connecting to a central gallery entitled Our Land. Hundreds of our city’s most beloved artifacts are featured, including the display case from Fred Harvey’s Alvarado Curio Shop and the 8th Duke of Alburquerque’s Repostero. Bring the family for a hands-on experience! We are a culturally diverse people living along a big river in a great desert. We see ourselves, and those who came before us, as spirited, courageous, resourceful, and innovative. Our connection to the land and to each other has produced a way of life that could happen Only in Albuquerque. As you explore our past, we hope you will think about what role each of us plays in shaping our future. Teacher & School Tours Information for teachers about school tours at Albuquerque Museum and Casa San Ysidro. Schedule a Magic Bus!